← 18-Course Omakase at Yasu! Finally, we come to the last restaurant we dined out at on this year’s MC & Prep Retreat. (Hello, soon-to-be-over-backlog at stenoodie.) :] After a second lovely night at our private villas at Pinestone Resort, we woke up the next morning (rather late for most of us) and packed up and then headed to a local fish and chips restaurant for brunch at 11 a.m. 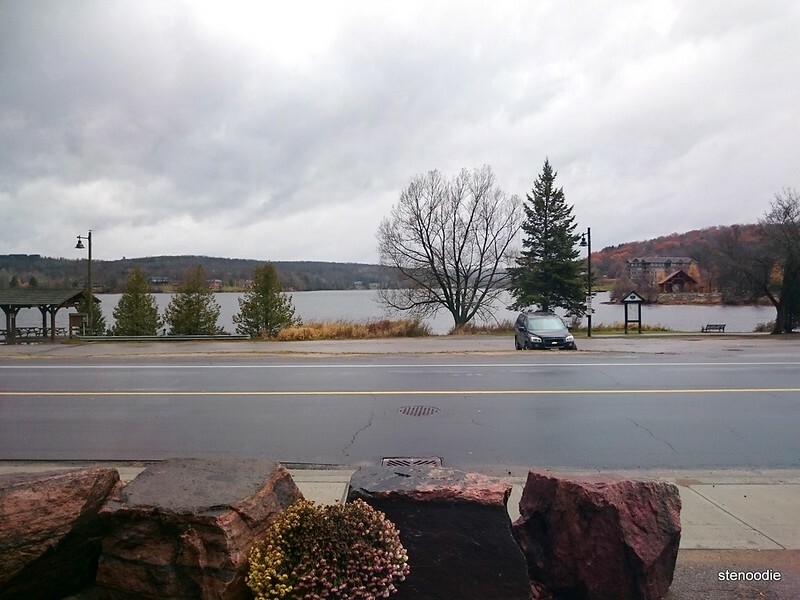 It was a little rainy and gloomy outside, but Baked and Battered Cottage Bakery & Fish Fry faced a beautiful small lake (Lake Head) that would have been breathtaking in the summer and early autumn when the colourful leaves were still hanging on the trees (unfortunately I think we were a week late in seeing the autumn colours in Haliburton). 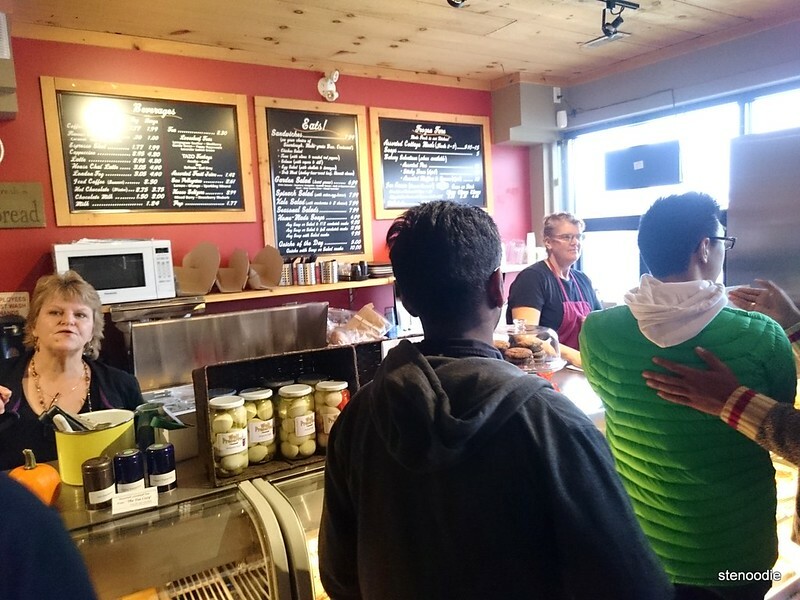 The 20 or so of us crowded around the counter where we placed our orders for the fried fish and chips. 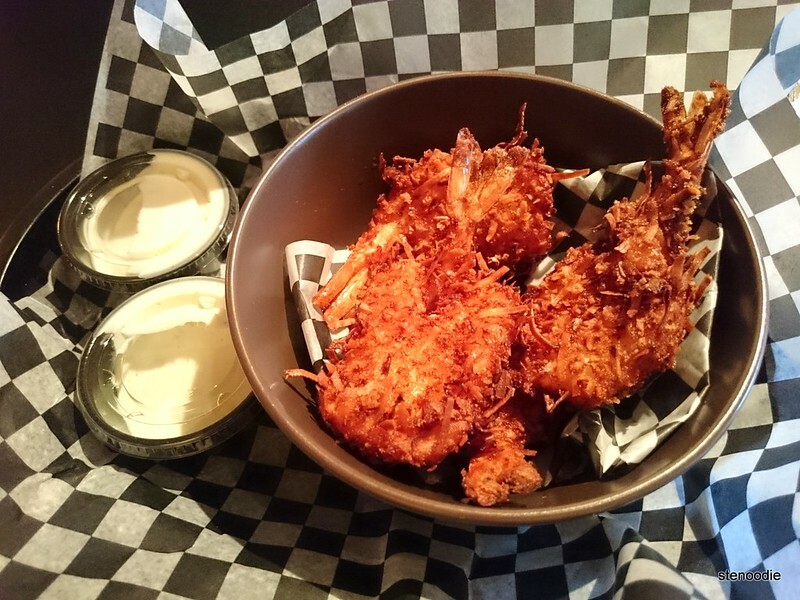 You place the order and leave your name, take a seat in their very Canadian-styled dining room, and then they deliver the order to you in your seat. 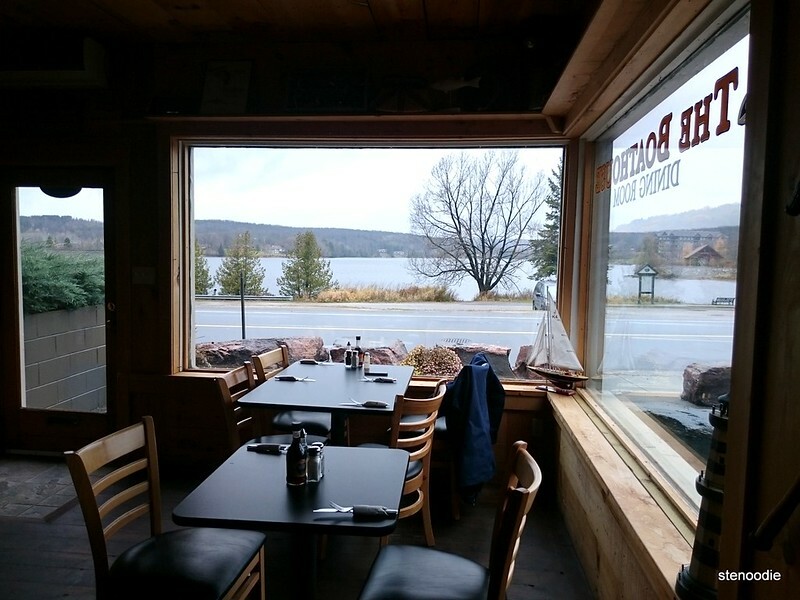 I say that their dining room area was very “Canadian” because it had a very woodsy feel with wood-paneled walls that looked like we were inside of a cabin and lots of decor placed up around the room of loons, fish, fishing lure, and other naturey odds and ends. It was really nice! The lady serving us was very good-humoured and friendly too. These were actually pricey for almost $2 a pop, but they were so tasty! 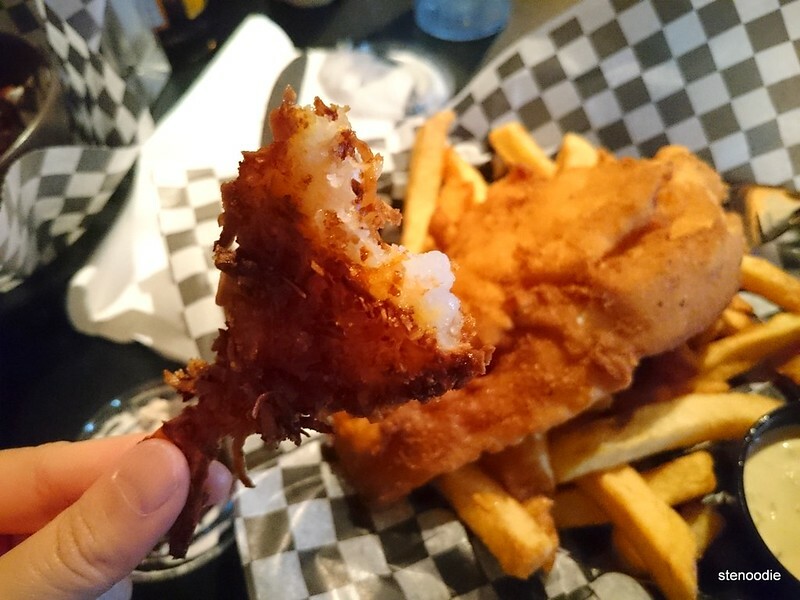 The first couple of bites into the fried piece of haddock were absolutely amazing. The fillet was so soft and tender! I really enjoyed it. 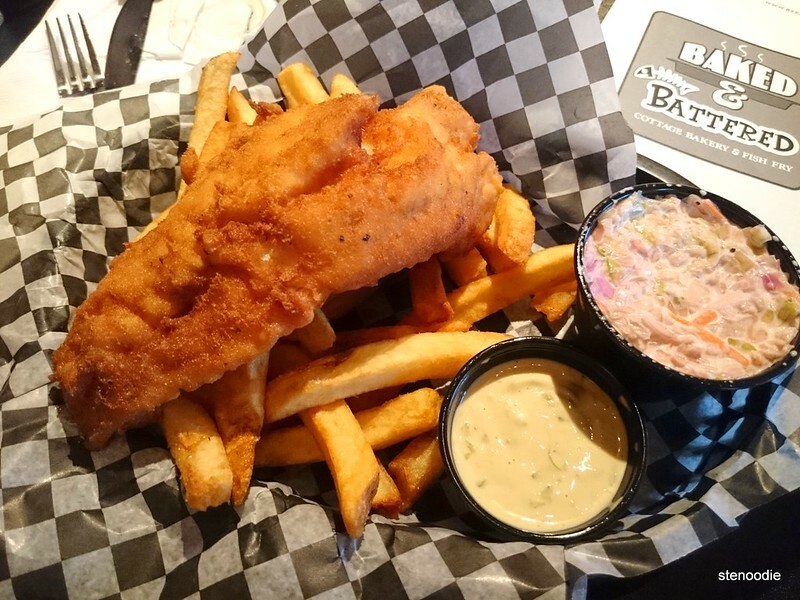 The tartar sauce was not bad but I wish it was a little bit more creamy. 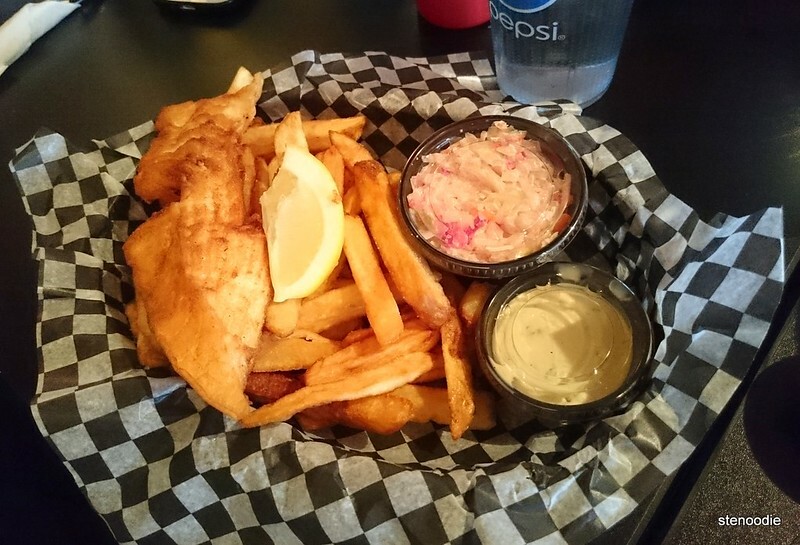 The fries and coleslaw were all right. The coleslaw was a little too watery in my opinion. 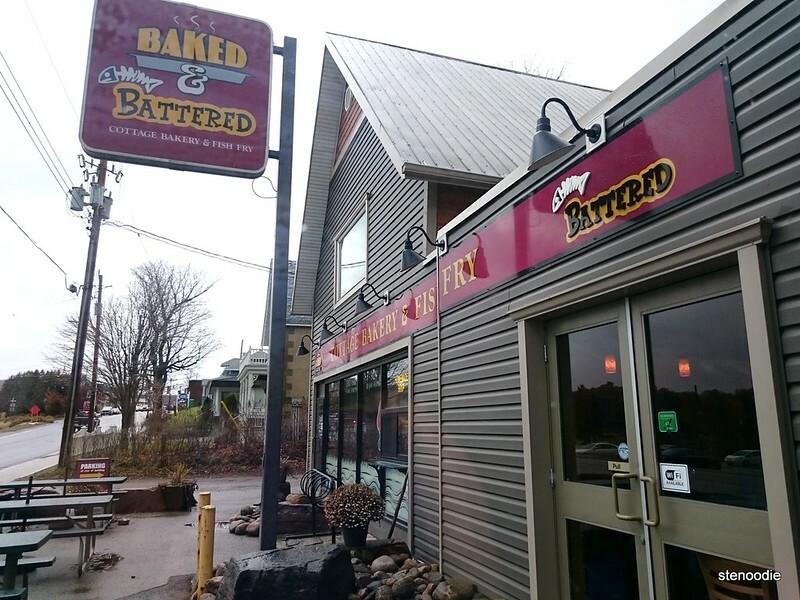 The bakery side of Baked & Battered! After we were done eating, we walked over to their bakery that was connected directly to their fish and chips store. 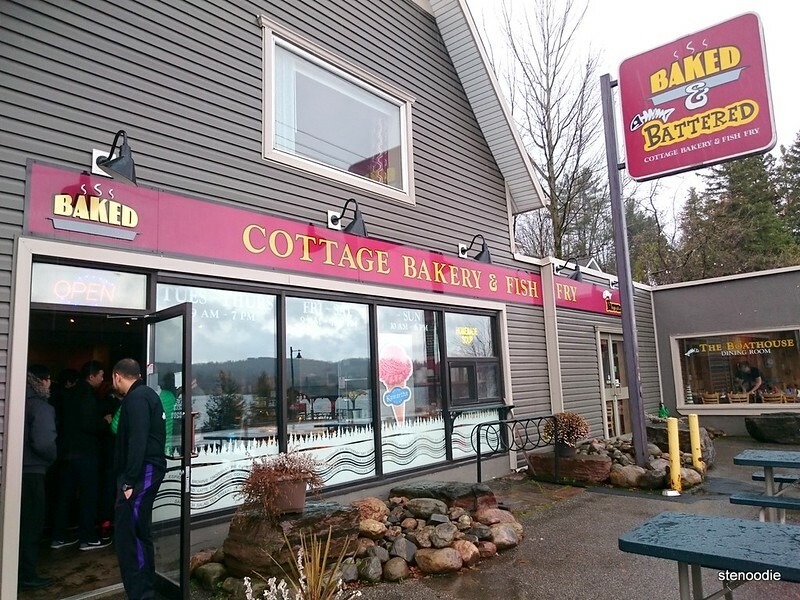 I thought that their namesake was genius: “Baked and Battered Cottage Bakery and Fish Fry”; they sell baked goods and also fried battered fish. There were a lot of people here and there was a steady stream of customers as we loitered here for a while. Some of us ordered pastries and coffee before we headed back on our 1.5-2 hour road trip home to Markham. Look at all these baked goods! 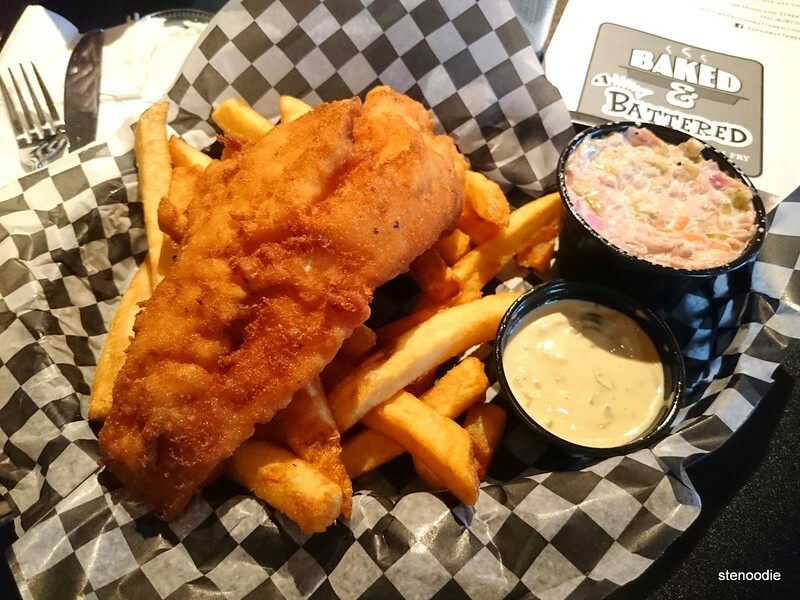 This entry was posted in Food and tagged 128 Highland St, Alaskan halibut, Baked and Battered, Baked and Battered Cottage Bakery & Fish Fry, Baked and Battered Cottage Bakery and Fish Fry, baked goods, bakery, coconut shrimp, cod tail, coffee, dine-in, fish and chips, food blog, foodie, fresh cut fries, fried fish, haddock, Haliburton, homemade coleslaw, homemade tartar sauce, Lake Head, Ontario, pastries, pickerel, restaurant review, seafood, The Docksider. Bookmark the permalink.